It's been a while but I have a freebie Popup card for you today. Could be useful for a number of occasions, birthday, Graduation, Anniversary etc. Hope you like it. Thanks in advance if you leave me a comment. Thank you for this lovely file. Hope you enjoyed your holiday. How did you know I needed this? LOL! Thank you for sharing. This is just so perfect for invitations I am making ! Thank you so much for your generosity. You are so talented. Hello Shirley, Thank you very much for this beautiful template ! Thank you so much for this card. It is wonderful! As always you have been so generous and shared your talent with us, thank you so much. This is going to be another one I use a lot. Merci Shirley pour ce nouveau et joli partage. Thank you Shirley. I love pop-up cards and this will be well used. Thank you. Need to get this cut right now! Thanks for a great card. Will have lots of uses for this for sure. Thank you for a great card. I will be using this for many occasions, it is so versatile. I love your thinking, this is a SUPER insert, with not just the word but with "twiddly" bits too. LOVE it, thank you Shirley. Thank you so much for sharing your talent with us. 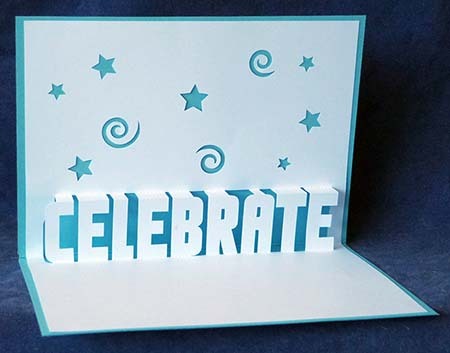 The Celebrate card is versatile for so many occasions. Thank you simple but so cute. Thank you Shirley. I love your simple cards. Not sure how to do this but I am sure going to try........I love it! Thank you so very much! Glad to 'hear' from you again, Shirley. Thanks for sharing your cute card.